We were sitting on the beach, staring out across the water of Nantucket Sound, when suddenly someone piped up, "What is a sound, anyway? What's the difference between a sound and a bay?" Nobody knew the answer, exactly, although there were many opinions. Until someone pulled out his smart phone and googled the answer for us. So if you landlubbers will indulge my sudden interest in the maritime lexicon . . .
A sound is a large ocean inlet (such as Nantucket Sound) or a narrow ocean channel between two bodies of land (such as Vineyard Sound). But there must be some flexibility in the definition, because . . . what is Puget Sound? By the way, the word sound also refers to measuring the depth of the water, and is also said of a whale when it dives to the bottom. 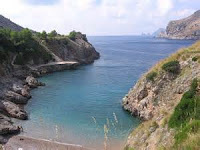 A bay is a body of water connected to the ocean or lake that is surrounded by land on three sides, and is formed by an indentation in the shoreline. We have Cape Cod Bay and Buzzard's Bay here in Massachusetts, and a lot of other bays along the East Coast from Delaware Bay and Chesapeake Bay on south. The West Coast doesn't have so many bays. A gulf is a large bay, such as the Gulf of Mexico, the Gulf of California or the Gulf of Alaska. So what's a cove? It is a small bay that's usually round or oval in shape with a narrow opening to a larger body of water. And how is that different from an inlet? An inlet is typically long and narrow, an indentation of the shoreline of an enclosed body of water. And a fjord is a long, narrow inlet with steep sides created by glacial erosion. You don't have to be in Scandinavia to find a fjord. The Hudson River is actually a fjord. Then what's a harbor? A harbor is a bay or cove or inlet where boats are at anchor -- and is often artificially created or enhanced by breakwaters, sea walls or jettys. So there you have it . . . why, you can almost believe that you've been out at the seashore for a couple of weeks yourself! I called Cape Cod a spit of sand. But actually it is a terminal moraine left over from the last glacier which deposited big piles of rocks and other debris when it started to recede some 18,000 years ago. We now call this debris Cape Cod, Nantucket, Martha's Vineyard and -- by far the largest -- Long Island. That being said, there's a lot of sand on Cape Cod. We went to the beach on Nantucket Sound, arranged our beach chairs and sat in the sun and the sand for several hours (with plenty of sunscreen). Usually, the water off Cape Cod is pretty cold. So we were surprised to find it a relatively tolerable 72 degrees or so. It was so warm that I actually went swimming, which shocked B, since as she constantly reminds me, I am pretty much of a wimp when it comes to cold water. Then we rode our bikes up to Seymour Pond, which is a kettle pond -- a shallow body of water formed by the retreating glacier. Some kettle ponds turn into marshes and bogs. But Seymour Pond is nice fresh water, and small enough so the sun heats it up to 76 or 78 degrees. So the temperature was nowhere near glacial. I not only went for a swim, but I actually stayed in for a while. We also went to an outdoor band concert, where they were celebrating the birthday of Sadie, a beloved local grandmother. She's 95 years old. The band leader was not much younger than that. But he did a great job, and entertained us with various American classics as well as a soulful rendition of "Old Cape Cod." Another local celebrity was Thomas "Tip" O'Neill, who was elected to the Congressional seat vacated by John Kennedy in 1952. O'Neill served as Speaker of the House from 1977 until his retirement in 1987. He died in 1994. Other than that . . . we've been eating. Clam rolls, clam chowder. Lobster rolls; lobster tails; lobster . . . oops, I mean, chowdah and lobstah, which is the way they say it around here. Which is one of the reasons why I like to go on vacation. You meet people who are a little different, with different backgrounds, different accents, and different views. Now that I've been certified as a safe driver, B and I are going on vacation, driving up* to . . . well, you tell me where. As soon as we arrived we took our bikes out to the National seashore and rode the loop through Beech Forest and out to Race Point Beach. Fog bank over the ocean. Blue sky above. The trail is about six miles long, making its way up and down the dunes. We finally arrived at the beach. The water was a little too cold to go swimming. There was a fishing boat out there in the fog. We then sweated our way back up the hill, put the bikes back on the car, and drove into town, where we wandered around with all the other tourists. We ate lunch at a place near the pier called the Surf Club. Guess what I had for lunch! I made a new friend . . . Which one is the real fisherman? past the Governor Bradford restaurant. But first, B had to find a bathroom . . .
And if you haven't figured it out by now, we're vacationing on Cape Cod. We spent the day in Provincetown, as far out on the Cape as you can get. Provincetown is located on what is referred to as the Lower Cape, even though it's north of the Upper Cape, which is where we stayed last year in Falmouth. If you say that Provincetown is on the Upper Cape, they know you're not from around here. * Another way they know you're not from around here: If you say you're going up to the Cape. That means you're from someplace else, like New York, New Jersey or Pennsylvania. 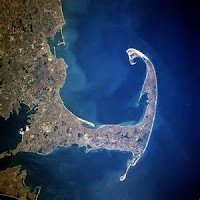 If you're a real New Englander, you say you're going down to the Cape, since the Cape is to the south. That's how the Bostonians tell if you're "one of us," as opposed to one of those tourists from somewhere out to the west where the yahoos live. My new auto insurance bill came last week, showing a $120 increase for the next six-month period. Yikes! So I got on the phone and called my agent. She told me that my discount had expired from when I had taken the Motor Vehicle Accident Prevention Course three years ago. So I had to take the course again. You can sign up and go to a class. But I elected to do it on the computer. It consists of a series of pages that review all the stuff you already know about auto safety. The pages are timed, so you can't go too fast, and periodically you have to answer a question to make sure it's you taking the test, and not somebody else. The minimum amount to time allowed for the test is six hours. Six hours of sheer boredom. But it does remind you of a few things. And it does save you 10 percent on your auto policy for three years. So here are some of the things I found out from taking the test. You're not supposed to drink and drive. You're not supposed to speed or roll through stop signs or run a red light. Personally, I have never run a red light. Have you? If so, you're not alone -- 56 percent of drivers admit that they have! Here are a few other things I found surprising -- or if not surprising, at least telling . . .
People over age 65 make up approximately 12 percent of all drivers. In general they get into fewer accidents than other age groups. But people over 65 account for 16 percent of crash fatalities, presumably because when they do sustain injuries they are less likely to survive them. I was also surprised to find out that people over 65 account for 19 percent of pedestrian fatalities. So be careful when you're crossing the street or walking through the parking lot! In 2010 -- the figures they had on the test -- there were 32,788 Americans killed on the road, many fewer fatalities than the bad old days of the 1960s and '70s, before air bags and seat belts, when over 50,000 people were killed each year. However, I recently read on CNN that so far in 2015 auto fatalities have actually increased over last year, and they are speeding along at the highest rate since 2007. A little less than 5 percent of fatal crashes are due to a driver falling asleep. You're most susceptible to falling asleep when you're sleep deprived, obviously. But people are also more likely to fall asleep at the wheel when they're driving alone, driving at night, driving on long trips. Truck drivers are more likely to fall sleep than regular drivers. About 12 percent of fatal accidents involve large trucks. About 15 percent of highway fatalities involve a motorcycle. Per mile driven, a motorcyclist is 34 times more likely to die in a crash than a passenger in a car. Some 30 percent of crash fatalities involve drivers who are under the influence of alcohol or drugs. But even slightly more than that -- 31 percent -- are caused primarily by speeding. The reason speed is so dangerous is because it cuts your reaction time if something goes wrong. At 55 mph, by the time you recognize a problem, react and then brake, it will take about six seconds to stop and you will have traveled 100 yards. At 70 mph, it will take the same six seconds, but by then you will have gone over 150 yards before you stop -- that's 50 more yards when you can run into something, or someone. There's also a reason why speed is so deadly. I don't pretend to know the physics of it. But what causes injury and death is the force of impact against the human body. The force of impact is in direct proportion to the weight of a vehicle, which is why, all other things being equal (which they rarely are), heavier vehicles are safer than lighter vehicles. But force of impact has a squared relationship to speed, which is why, no matter how equal or unequal everything else is, you're a lot more likely to suffer severe injury or death at 70 mph than you are even at 60 mph. So there you have it. I'm sorry. I can't offer you a 10 percent discount on your auto policy. But at least my policy will be going up only $40, instead of $120 for next year. And hopefully, I'll stay alive long enough to reap the benefit! I ran across a survey done last year, sponsored by Ally Bank, that questioned more than a thousand people to find out what makes them happy. The survey focused on money, but as an outgrowth of the questions, some interesting findings popped up about what really makes people feel good. Everyone knows that enjoying the intimacy of a long-term relationship improves your chances to be happy. And it helps if you're lucky enough to be in good health, have some close friends and enjoy a positive relationship with children or grandchildren. 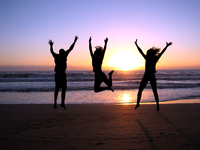 But the survey revealed four other significant factors that contribute to a higher level of personal happiness. First is exercising. Almost 60 percent of the respondents said that taking part in a regular exercise program makes them feel happy. Why? Engaging in exercise is a positive, helpful way to cope with stress. Studies indicate that exercise mimics the effects of antidepressants. It helps increase our energy levels, and boosts levels of endorphins and other "feel-good" chemicals in the brain. Participating in a sport or exercise program can give you a sense of accomplishment, and if you do it with other people (golf, tennis, softball, dancing, a spin class), helps you make friends and feel like you're part of a supportive social group. A good workout has also been shown to improve people's sleep patterns, as well as promote the development of new brain cells that can increase memory and learning capabilities. The issue for retired people is that we no longer work. Yet work leaves its legacy. We still identify with our profession. We're retired; but we tell people that we once were a lawyer, teacher, banker or chef. And we all know that we can still find a sense of accomplishment in our volunteer work, or our artwork, or our classwork . . . or in helping take care of our grandchildren. Eating healthy. The foods we eat indirectly but indisputably influence the functioning of our brains. One key to improving our mood is to cut back on sugary and salty snacks in favor of nutritious alternatives. A study published in Archives of General Psychiatry found that people who ate a Mediterranean diet rich in olive oil, vegetables, fish and whole grains reported 30 percent fewer depressive symptoms than those who consumed a typical American diet. In addition, of course, people who eat right are less likely to get sick; they recover more easily if they do get sick; and they likely live longer than people who are overweight or consume a poor diet. In addition, certain foods affect our brain chemistry and help us stay happy. It's no coincidence that we turn to carbohydrates, from cookies to ice cream, from pasta to peanuts, when we are feeling blue. Carb-rich foods stimulate release of serotonin, which at least in the short term tends to improve our mood. And then there's chocolate. Personally, I'm not a big fan of chocolate. But the nutritionists tell us it boosts levels of brain chemicals like phenylethylamine and anandamide that can bring on a euphoric feeling. Saving money. The Ally survey showed that it's not how much you earn that makes you happy; it's how much money you have left over. A surprisingly high 84 percent of people acknowledged that saving for a rainy day makes them feel more secure and more in control of their lives, leading to an overall sense of well-being. And the more you save, the more likely you are to be happy – 57 percent of those who boasted $100,000 or more in savings were extremely or very happy, versus 42 percent who'd squirreled away $20,000 to $100,000 and 34 percent who had less than $20,000 to their name. Of course, most retired people are not adding to their accounts. We're withdrawing. But the happiness factor comes with the sense of control. So if we have a plan, and can reasonably expect that our retirement resources are going to cover our needs, then it helps support that sense of well being, and even accomplishment.